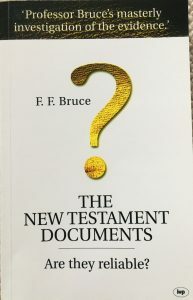 F. F. Bruce – The New Testament Documents: Are they reliable? 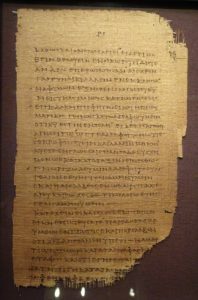 The New Testament Documents: Are they reliable? by F. F. Bruce. IVP. 6th Edition, 2009. It’s taken me till now to read this book. And what an excellent book it is. I was very encouraged by reading it. It does have a downside. So let’s get that out of the way first. The latest reference to any work is 1990. To me, because I’m older, that sounds quite recent – modern even. But when I think it through, that’s 28 years ago! Many of the reference works are much older, even though the research may still stand up. It’s an obvious point of criticism. I’m sure there are more recent books that build on and enhance the work in this book. A more recent book to recommend is Michael Kruger’s ‘Canon Revisited‘ Nov 2013. Given that, it’s a great read. It’s very helpful. It isn’t long. Just 141 pages. It has page footnotes which I like, a scripture index, suggested further reading for each chapter, and an index which I also like. If you’ve never read anything on this subject before, this is a great place to start. ‘Reliable as what?’ asked a discerning reviewer of the first edition of this little work, by way of a comment on the title. His point, I think, was that we should be concerned with the reliability of the New Testament as a witness to God’s self-revelation in Christ rather than with its reliability as a record of historical fact. True; but the two questions are closely related. For, since Christianity claims to be a historical revelation, it is not irrelevant (or irreverent, my comment) to look at its foundation documents from the standpoint of historical criticism’. He doesn’t shy away from the problems but shows how in terms of their historicity the New Testament documents fair very well. In fact, they fair much better than other ancient texts (ch 2, pp 21-23). He mentions the Chester Beatty (Library) Biblical Papyri. I was able to see some of these on a recent trip to Dublin. I’m not quite sure which ones are referred to in the book but see one of the pictures below I took of the manuscripts. He takes some time looking at the miracles (ch 5) but points clearly to the resurrection of The Lord Jesus Christ. ‘This response of faith does not absolve us from the duty of understanding the special significance of the several miracle-stories and considering each in the light of available knowledge, historical research and otherwise, which can be brought to bear upon it. But these are secondary duties; the primary one is to see the whole question in its proper context as revealed by the significance of the greatest miracle of all, the resurrection of Christ’ (p.82). The chapter on Lukes Gospel (ch 7) was really excellent. Especially so when it came to the accuracy of places, names, and titles. Very encouraging. An obvious point, which I hadn’t thought about, was how there were many writings out there that Luke was able to use in order to write his Gospel and The Acts of the Apostles. Luk 1:4 that you may have certainty concerning the things you have been taught. The most important aspect of the book wasn’t his proof of the NT Documents historicity, which he does admirably, but his confession that it takes a work of the Holy Spirit to make a person alive to Christ. In the final analysis, even if they are accepted as completely reliable, which they are, it’s only the Holy Spirit that can grant repentance and give life. The question Christ asks of us all is ‘Who do you say that I am?’. Mat 16:17 And Jesus answered him, “Blessed are you, Simon Bar-Jonah! For flesh and blood has not revealed this to you, but my Father who is in heaven. I should have taken notes or made comments and underlining in the book. I didn’t. Nevertheless, I thoroughly recommend this book to any believer or unbeliever for that matter. If your church has a library, put this book in it. The New Testament documents: their date and attestation. The canon of the New Testament. The importance of Paul’s evidence. The evidence of early Jewish writings. The evidence of early Gentile writers.